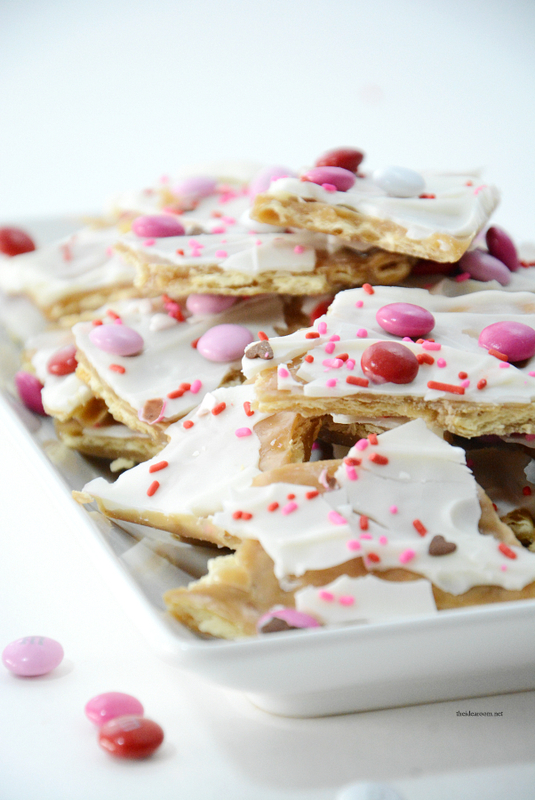 I have been wanting to make Saltine Cracker Toffee for a while now but haven’t had a chance to get around to it. I finally had an excuse to make some for a get together we had with some friends. 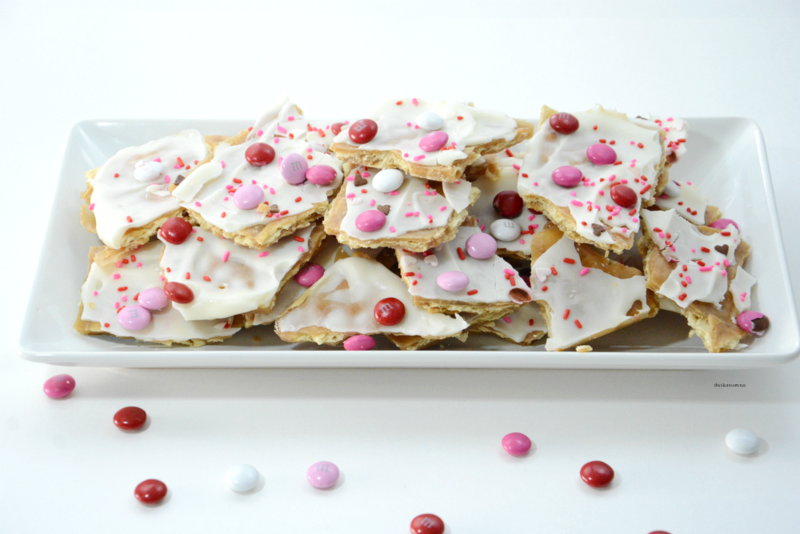 I decided to make a Valentine’s Day version and used white chocolate instead of a milk chocolate. This stuff is dangerous…I would suggest you make it and give it away! 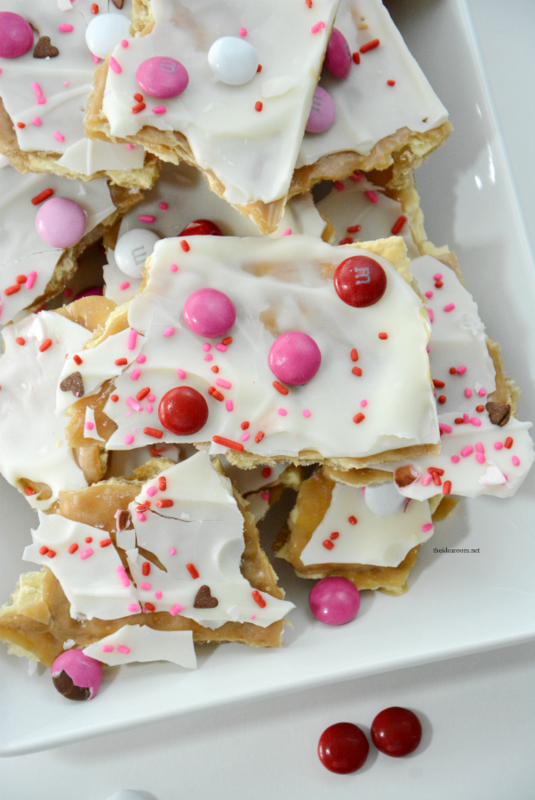 You can make this with white chocolate, almond bark, milk chocolate or a dark chocolate. You can also add any type of add-ons that you like. 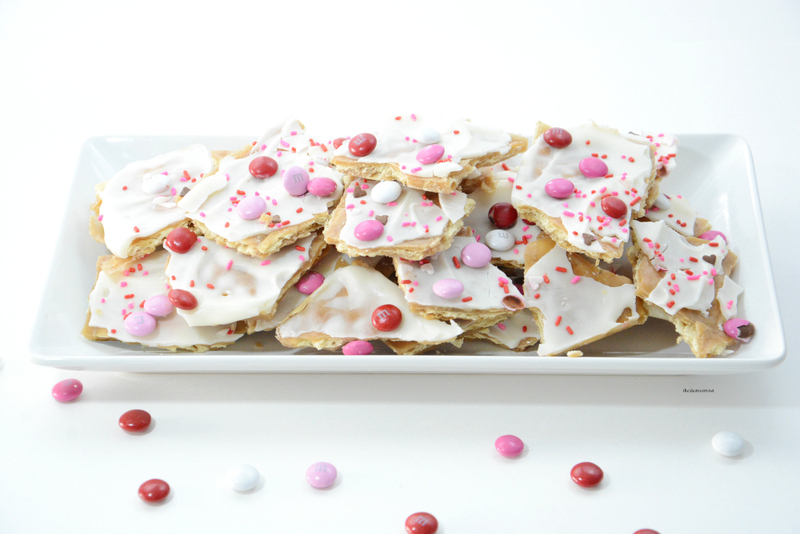 Some great add-ins are m&m’s, sprinkles, nuts, crushed candy canes, etc. I have also seen people substitute Graham Crackers in place of the Saltine Crackers. So feel free to make any changes and adjustments to fit your personal preferences. Line a large jelly roll pan with aluminum foil. Spray the foil with non-stick cooking spray and then line the pan with saltine crackers. Place the butter and sugar in a medium sized pot over low medium-low heat. Stir until the butter is melted. Once the butter has melted, bring to a boil. Stir constantly. Turn down the heat and simmer for 3-5 minutes until thickened. Once it’s nice and bubbly, remove pan from heat and add vanilla. Pour evenly over saltine crackers. Spread mixture with a knife… however it doesn’t have to be perfect. Try to move fast during this part so the toffee doesn’t harden. Place pan in the oven and bake for 5-7 minutes. Remove pan from oven and then sprinkle the chocolate chips on top of the toffee while it’s still hot. Let the chocolate chips melt for a few minutes and then spread all over the toffee with a spatula. OR let the crackers and toffee cool. Melt chocolate in microwave or double boiler and spread over crackers. Sprinkle M&M’s on top and then place in the freezer for 30 minutes. Once chocolate has hardened break pieces off the foil and in an container. It will stay fresh for a couple of weeks in an air-tight container. If you liked this post, I would love for you to pin it! Thank you! 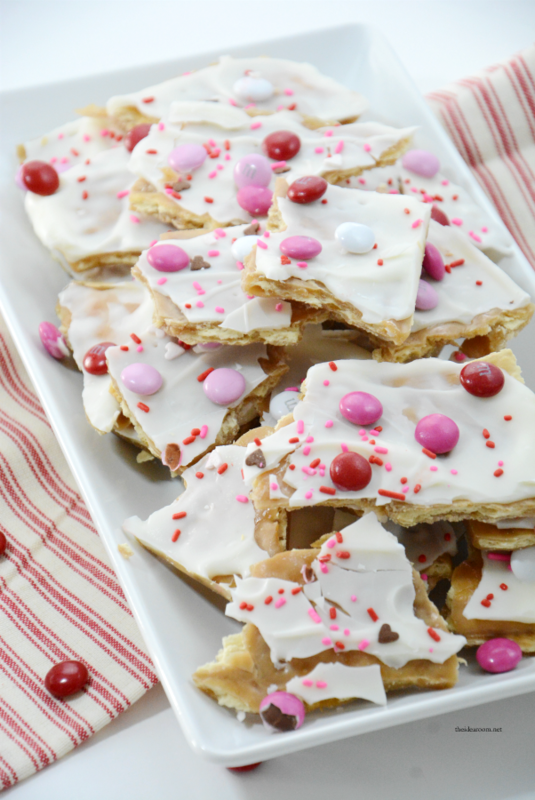 These look like a perfect treat to make for our kiddos Valentine’s Day parties! Thanks for the cute idea! I have not tried graham crackers before. 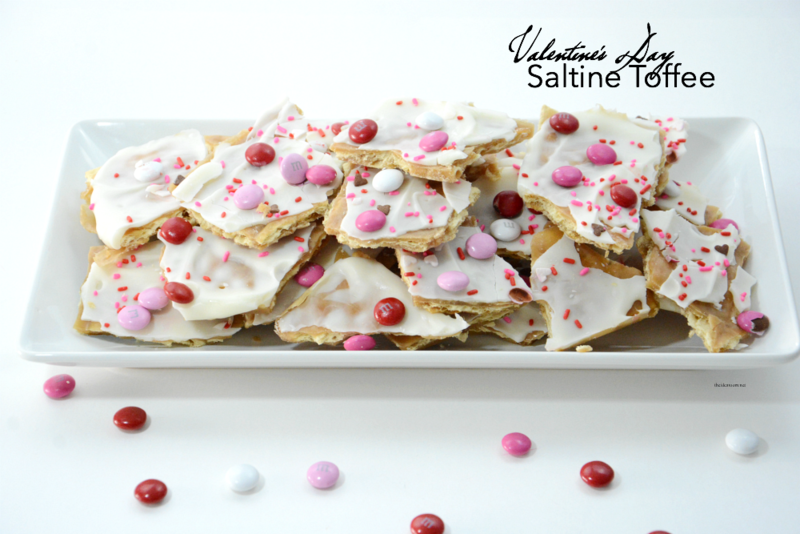 The Saltine’s are yummy because you get the salty with the sweetness. If you try the graham crackers you will have to let me know how it works out. I’ve used Graham crackers. They work fine, too. Did you add vanilla to the toffee mixture? Or what was the step after you melted the brown sugar/butter it looks like you put a teaspoon of something?